At a Nintendo event in New York yesterday, I got to play two quick rounds of Rayman Legends. If you've played a Rayman game, particularly the recently-released Rayman Origins, the game will be instantly familiar to you. 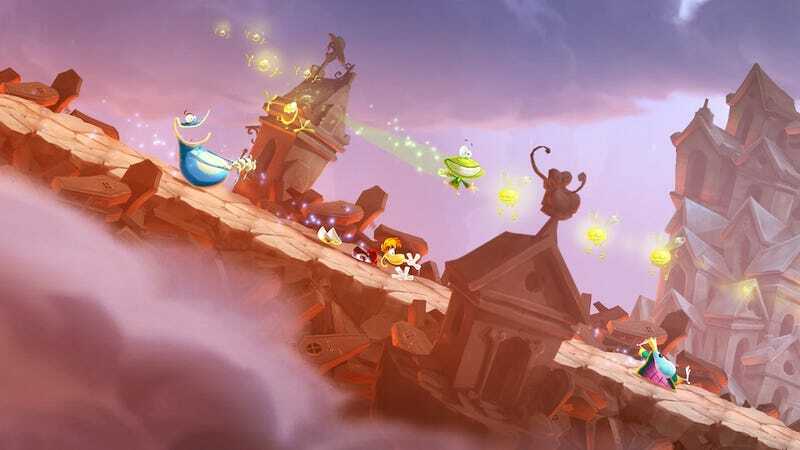 Side-scrolling adventures with up to five players make Rayman Legends the perfect party game platformer, with guaranteed giggles and maybe a few cuss words. However, there's a distinct difference between how Rayman Origins played and how Rayman Legends is shaping up. It might just be my playful competitive nature, but I was constantly smacking down my friends in Rayman Origins, stealing the most coins and Lums as I could. Part of the fun, even during that loading screen between levels, was abusing and chasing your "teammate." Rayman Legends, however, is much more collaborative. There's even the return of a classic Rayman character, Murfy, who is designed specifically to help you assist your teammate. Murfy can swipe at enemies trying to attack Rayman, or expose more Lums for him to collect. By tapping on incoming Lums, Murfy can turn their yellowy visage purple, claiming part of the rights to the spoils. He brings down bridges, and uses the gyroscope of the GamePad to rotate blockades out of Rayman's way. Rayman Legends is something of a rhythm game, too. Rayman will be hitting walls and jumping on cue to guitar riffs or drum hits, while Murfy taps in unison with the music, too. While playing momentarily with Stephen Totilo, I blurted out my frustration each time I missed a beat. Stephen mentioned that it was funny how disparate our experiences were. There he was, hitting all his cues on time thinking everything was going well, while I'm voicing mishaps. Stephen was focused on watching the GamePad, protecting me from enemies flying in from above, and turning as many Lums purple as he could. But his priorities were different from mine. Though he could plainly see me on his screen, and I could see his character on the TV screen, we were both buried in our own activities. And yet, we both had to suffer for each other's mistakes. Rayman Legends is a new Rayman experience that takes advantage of the Wii U's unique console setup, effectively altering my experience of a game I'm familiar with. It's still the same fun, side-scrolling game, and is still perfect for a group of friends to huddle around. It's still cute, colorful and lush. It has that same personality as all the Rayman games you've played. But it's distinctly different in that you're more likely to work with your friends, experimenting in ways to help make your way toward a similar goal. Though okay, I'll probably still smack everyone a few times for laughs regardless.